RG Technologies develops and distributes the high performance CAD-program CCAD Design. CCAD Design has been successfully used for many years in different leather and textile processing industries. These are the shoe industry, producers of bags and leather goods, the furniture industry as well as the automotive industry. CCAD Design provides the intelligent opportunity to scan outlines and patterns that only exist on paper. Subsequently they are being converted and imported in one step. This innovative method allows to work more accurate and faster. The purchase of a digitizing tablet is not applicable. Expenses and time are being saved with the digitizing method of RG Technologies. Patterns are vectorized automatically. They are available for cutting immediately. Outlines can be digitized after import. After digitizing they are being elaborated technically with the functions of the 2D design. 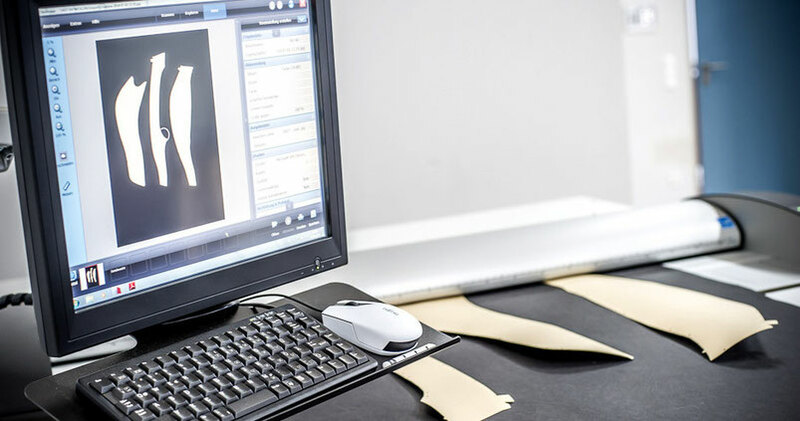 Scanning can be done on standard A4/A3 scanners or at appropriate pattern size with very powerful large format scanner. For further information to technical details please get in contact with us. CCAD Design forms the basis for the technical model creation and model development. CCAD Design is a very comprehensive and innovative system that includes all necessary functions for the two-dimensional implementation of free-form objects. Through the integrated user interface the operation of the system is largely self-explanatory. Most working steps run interactively. This makes the system even for CAD beginners quick and easy to learn. In CCAD Design the basic model is being digitized directly on the screen. After digitizing the details of the model are being worked out in consideration of model specific and technical conditions. All necessary design elements such as foldings, underlays, seams, linings and interlinings are being defined exactly. Following these working steps the patterns are then being created in the 2D Design. These patterns are linked to diverse model ares like upper material, lining, interlining and reinforcing material. Marking splines and notches are defined at the existing patterns. Pattern edges are being rounded automatically or manually or are defined as bevels. Several functions are available to create eyelets and perforations within the pattern. CCAD Design also leaves nothing to be desired in the field of construction. All important basic functions are included in the system. In addition, CCAD Design contains a variety of unique features that greatly facilitate the design of models and make working much easier. New designs can be elaborated on basis of models that already exist. This is a very time-saving way to work. An extensive library of standard patterns, administrated by the user, also helps when creating models with recurring elements. CCAD Design gives the user the opportunity to create libraries for a large part of the design elements. When doing the technical model preparation, the user can load the elements with given settings from the referring library. Work is becoming faster and as an side effect all the designs have an unified look. To a large extent all the cutting parameters like tool allocation, cutting directions and pen-up points are being defined automatically by using the settings of CCAD Design libraries. This applies for cutting cardboard and series orders for a integrated cutting system. The first implementation of the libraries is done by the project management of RG Technologies after consulting the user but can be also edited at any time. With the grading module CCAD Design provides all the necessary functions that are essential for the rapid creation of the single sizes of a model. All major grading systems such as English, French or Mondopoint are naturally deposited with their values in a library. The steps of length and width can be defined differently at any time. This can happen in model groups, but also from model to model. Size notches may optionally be set before grading. After grading it is still possible to change each image separately. Grading starts with the definition of the grading system. The steps in length and width are loaded from the grading library or are being defined individually. Then, the length axis, the width axis and the central point, from which the normal grading starts are set. First, the model is being graded with the normal grading. The result is a linear gradient in length and width. With the central grading, previously defined areas can be grouped into size groups. This is useful for cost reduction when using press knifes. If necessary, a rotation or translation grading rule can also be set. The various grading rules can be combined with offset gradings to ensure a smooth transition. After creating the sizes, the single patterns can be aligned and displayed individually or in a combination of certain sizes and patterns. After saving, the grading the patterns are available for further processing, for example for cutting. CCAD Orthopedics supports in designing orthopedic shoe models. The left and right sides of the shoe are strictly separated though they pass through the production process together. Last data of the patient can be projected on any model from a library of basic models. The model is being adapted to the customers last while maintaining its specific designs. The user does not need to do much rework thereafter. CCAD Orthopedics allows you to quickly create models. The requirements for an exact fit of the orthopedic model are of course fully met. The CCAD cardboard pattern nesting provides the ability to nest and to cut patterns which have been created or processed in CCAD Design. The automatic nesting takes place on the screen, taking into account the usable size of the material. Before nesting there is the possibility to decide individually the labelling of the pattern. The pattern can be labelled in any order with the file name, pattern name, date, size, surface area and circumference and any additional text. After choosing the patterns they can be nested and cut directly. The created orders can also be cut with a cutting system operated with CCUT. We recommend cutting tables from bullmer or Plotter Technology. The choice of a cutting table always depends on the production quantity of cardboards. Of course, the cut files are also compatible with other manufacturers' tables. A nested image can be exported in various formats and sent to manufacturing partners. RG Technologies offers the module CCAD Pattern Maker for companies with a large quantity of cardboards to be cut. With this additional software, patterns of several models can be nested together and cut at any time. Cardboard nesting and cutting enables the user the creation of sample patterns in order to check the design immediately and quickly. Any necessary changes can be implemented without wasting time. The CCAD Information System contains a large number of comprehensive and extremely meaningful information that arise in the context of CCAD Design. This may be information on pattern parameters such as circumference and surface area, number and type of pattern or efficiencies and user performance. There is information on the processing status of each file. These include when the file has been created, stored, loaded and released. The transfer data to other sites and the user who is or was working on a model can also be shown. The rights to save files can be sent and changed as needed. Links of files with each other, by sharing patterns, standard patterns or assemblies are also presented in detail. Information that go far beyond, and are even more detailed is provided by the CCAD Process Control. This offers you the complete overview of current status of your production process.